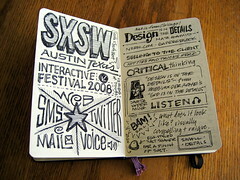 SXSWi 2009 will be a blast and I am looking forward to it. Only good things will happen from attending an event like this. Stay positive, STOP watching local news (they prey off of you getting upset from the "economic" crisis that is happening) and be happy... You only live once. @Brian, we're going to have an awesome time at SXSWi! I learned at lot from your sketchbooks. The variety of font is amazing. Your books keep my attention better than the average run of the mill notes. Inspiring! Both the format and the material of SXSW.